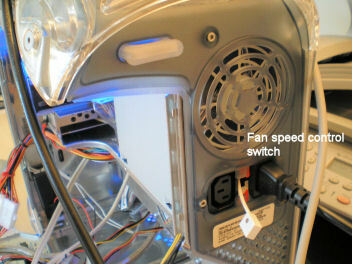 Purchasing a power supply that fits the case pays dividends here as it’s a straight fit and uses the original fixings. 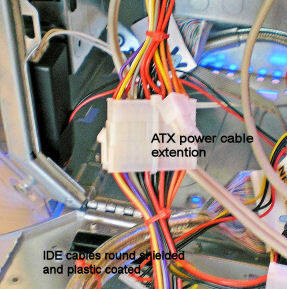 The only change that was needed is to lengthen the ATX cable, fortunately you can buy a 15cm extension cable which is long enough to connect to the mother board connector with the case fully open. As it’s an Intel board you will also need to lengthen the separate 4 pin 12V power connector, while you can buy extensions for these we just extended the existing cable by inserting some extra length using in-line barrel crimps. The stock PSU fan was a bit too noisy for us so we swapped it for a low noise Akasa, the white lead hanging out the back is the speed controller. We used the original case fan which draws air in from the case rear and blows cold air over the motherboard and importantly the graphics card. The bad news is that this is a 12V fan with an incompatible connector so you have to cut this off and either make up a 4 pin Molex to connect to the wiring loom or in our case look in the parts bin for a spare lead and connect using barrel crimp connectors. We used round IDE cables because they look so much better and they can be routed much easier in such a complicated case as this. We planned for this so this was a fairly straight forward fitment using the original fixings although we did find it easier to fix the IDE cable and power connector to the drive before pushing the complete assembly into position. Again thanks to forward planning we were able to fit the hard drive into it’s original caddy and it’s original position. The cables should be fitted to the drive first before fixing in position as the hinge can get in the way. Warning – We used the original front panel (see manual) but even though the original connector fits the ASRock motherboard panel connections don’t be tempted to just plug it in as the pin outs do not match up. You need to identify the power switch connections and match these up to the pin outs on the mother board. We also traced out the other connections to give us a reset etc. but could not get the power led to light so ours maybe dead.